Christians should never deal with drama especially having drama in the church. 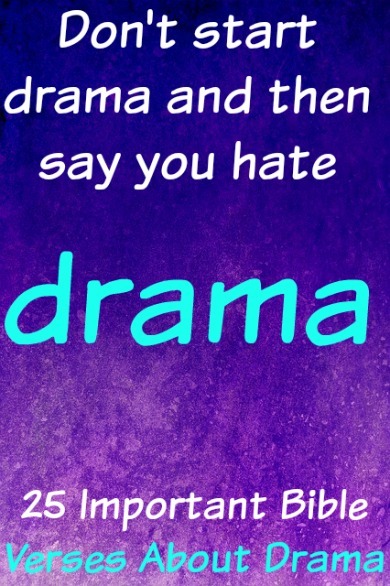 There are many ways drama can start such as gossip, slander, and hate which are not a part of Christianity. God hates fighting between Christians, but true Christians are usually not in drama. Many fake Christians who put on a Christian name tag are the ones who deal with drama inside the church and make Christianity look bad. Stay away from drama and conflict. Don’t listen to gossip. If someone insults you repay them with prayer. Don’t argue with friends and create drama, but instead kindly and gently talk to each other. 1. Galatians 5:15-16 However, if you continually bite and devour one another, beware that you are not consumed by one another. But I say, live by the Spirit and you will not carry out the desires of the flesh. 2. 1 Corinthians 3:3 For ye are yet carnal: for whereas there is among you envying, and strife, and divisions, are ye not carnal, and walk as men? If it has nothing to do with you mind your own business. 3. 1 Thessalonians 4:11 Also, make it your goal to live quietly, do your work, and earn your own living, as we ordered you. 4. Proverbs 26:17 He that passeth by, and meddleth with strife belonging not to him, is like one that taketh a dog by the ears. 5. 1 Peter 4:15 If you suffer, however, it must not be for murder, stealing, making trouble, or prying into other people’s affairs. When it starts with gossip. 6. Ephesians 4:29 Don’t use foul or abusive language. Let everything you say be good and helpful, so that your words will be an encouragement to those who hear them. 7. Proverbs 16:28 Wrongdoers eagerly listen to gossip; liars pay close attention to slander. 8. Proverbs 26:20 Without wood a fire goes out; without a gossip a quarrel dies down. When it started with a lie. 9. Colossians 3:9-10 Don’t lie to each other, for you have stripped off your old sinful nature and all its wicked deeds. Put on your new nature, and be renewed as you learn to know your Creator and become like him. 10. Proverbs 19:9 A false witness will not go unpunished, and he who breathes out lies will perish. 11. Proverbs 12:22 Lying lips are abomination to the Lord: but they that deal truly are his delight. 12. Ephesians 4:25 Therefore, having put away falsehood, let each one of you speak the truth with his neighbor, for we are members one of another. 14. Proverbs 15:1 A soft answer turneth away wrath: but grievous words stir up anger. 15. Galatians 5:19-20 The acts of the flesh are obvious: sexual immorality, impurity and debauchery; idolatry and witchcraft; hatred, discord, jealousy, fits of rage, selfish ambition, dissensions, factions and envy; drunkenness, orgies, and the like. I warn you, as I did before, that those who live like this will not inherit the kingdom of God. 16. Galatians 5:14 For all the law is fulfilled in one word, even in this; Thou shalt love thy neighbour as thyself. 17. Ephesians 4:31-32 Let all bitterness and wrath and anger and clamor and slander be put away from you, along with all malice. Be kind to one another, tenderhearted, forgiving one another, as God in Christ forgave you. 18. Proverbs 20:22 Do not say, “I’ll pay you back for this wrong!” Wait for the LORD, and he will avenge you. 19. Romans 12:17 Never pay back evil with more evil. Do things in such a way that everyone can see you are honorable. 20. 1 Thessalonians 5:15 See that none render evil for evil unto any man; but ever follow that which is good, both among yourselves, and to all men. 21. 2 Corinthians 13:5 Examine yourselves to see whether you are in the faith; test yourselves. Do you not realize that Christ Jesus is in you unless, of course, you fail the test? 22. Proverbs 20:19 He that goeth about as a talebearer revealeth secrets: therefore meddle not with him that flattereth with his lips. 23. Romans 13:14 But put ye on the Lord Jesus Christ, and make not provision for the flesh, to fulfil the lusts thereof. 24. Philippians 4:8 Finally, brethren, whatsoever things are true, whatsoever things are honest, whatsoever things are just, whatsoever things are pure, whatsoever things are lovely, whatsoever things are of good report; if there be any virtue, and if there be any praise, think on these things. 25. Proverbs 21:23 Whoever keeps his mouth and his tongue keeps himself out of trouble.